With the growth experienced this year in sneaker customization it is about time to reminisce on some of the better work that hasn’t been seen for a while and surely not forgotten with a new post series titled: Customs Lookback. To kick off these journeys into the past the year 2005 is visited with this Us Versus Them Nike Air Max 90 by Steppingrazor. By the time these came out elephant print was already in place as THE Nike print to try and recreate amongst customizers. Despite the many attempts by numerous skilled customizers their elephant print was really never made very close to Nike’s official print seen by that time on the Air Jordan III retro, Supreme Nike Dunk, and a few random retros. That was until Steppingrazor released these. 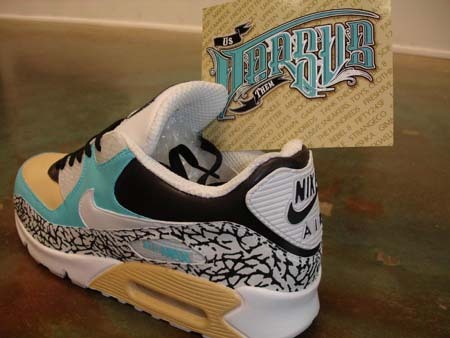 As a special offering at a store named Versus in Southern California for which Steppingrazor worked, 6 pairs were created of this Nike Air Max 90. The title Us Versus Them would later become the name of a clothing line run by the same company. What may look like a simple custom now at the time had other customizers online amazed by the accuracy of the recreated elephant print. The base being a simple Air Max 90 had an original colorway chosen by painting light blue, tan, and black on the all white leather base. These also hark back to a time when Nikes had all leather uppers. Looking at the tint of the mudguard we can tell they were prepped with acetone removing the white coating revealing the gray leather. These days that would be impossible as the past few years that area of the all white AM90 has been a “action leather”, Nike’s name for pleather. 7 years and this custom would probably sell out if an actual release with some stores name behind them, right?